Anna is a shut in. She lives alone in her townhouse in New York City. She watches her neighbors with her zoom lens from her window, but she doesn’t ever engage with them. When the new family moves in across the street, of course she checks them out too. She watches Mom, Dad and Son move in, and quickly becomes fascinated with them. Then one day she witnesses a murder in their house. Then she’s thrown into complete chaos. Did Dad just kill Mom? But when she reports it to the police both Dad and Mom come to her house and her credibility is completely destroyed. But she knows what she saw! How will anyone ever believe a crazy shut in? This one had me guessing all the way through. I didn’t doubt she witnessed a murder. But as I learned throughout the story there’s a lot going on that makes her look completely insane that makes me wonder if she dreamt the whole thing up somehow. If you’re looking for something that will keep you on your toes, check this one out. This one is told in past in present. In the past Emma and her boyfriend move rent a house built by a famous minimalist architect at One Folgate Street. The architect has instituted a series of rules designed to transform every person who lives in this house. No clutter, no personal belongings, no children, no pets, no leaving clothes on the floor, no bringing any furniture into the minimally furnished home. In the present Jane moves into the house. She learns that Emma died in the house, and the way she died was suspicious. 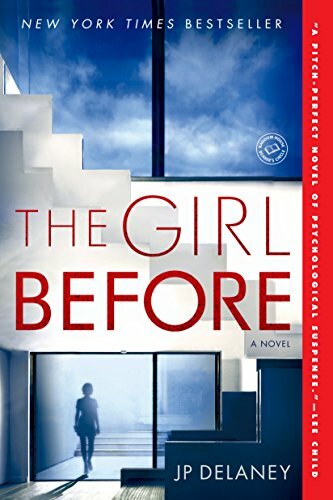 Jane is determined to learn the truth about what happened to Emma, but at the same time gets romantically involved with her control freak architect landlord. Jane starts to follow the same patterns as Emma. Will she be next to die at One Folgate Street? This one kept me on the edge of my seat with its twists and turns. I loved how Emma and Jane both tried to find out what happened to the women in the house before them. This is the same author who brought us The Devil Wears Prada. I loved that book, and I also will always watch the movie if it comes on TV. I loved the book because I am a sucker for expose type books about wealthy and fictitious famous people. But I will confess I wasn’t crazy about the sequel to Devil Wears Prada. But this one is kind of a sequel as well. While Devil was the story of Andy Sachs, we only got to hear a little bit about her co-worker Emily. 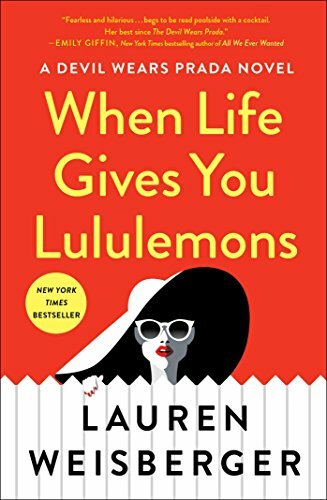 When Life Hands You Lululemons is told from the perspective of three women, and one of them is Emily from Devil Wears Prada. Emily is a public relations fixer for famous people. In the first chapter she’s fielding a call about one of her clients, a teen heartthrob pop singer, who was drunkenly wearing a Nazi uniform at a New Year’s party. And it’s Emily’s job to keep that out of the news and protect his image. But Emily’s problem is that a lot of her high profile clients are leaving her for someone more flashy. Emily is friends with Miriam, who is a former attorney turned stay at home mom in Greenwich, Connecticut. While Emily visits Miriam to lick her wounds after her career is taking a nose dive, Miriam’s friend Karolina is embroiled in a scandal. Karolina, a Senator’s wife, is arrested for drunk driving. The problem is, she’s not drunk and her husband and friends completely shut her out of their lives. Emily and Miriam rally around Karolina. Emily gets the opportunity to help Karolina revamp her image, while Karolina helps Miriam revamp her stale marriage, while Miriam helps Emily soften her own tough exterior and consider life beyond her career. It’s a very fun story about the different things that women bring to their friendships, and how vital the friendships between women are. 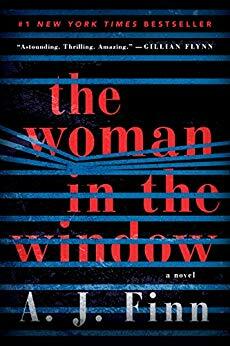 It was a very quick read that kept me engaged, and I genuinely liked all the characters. This book should have been the sequel to Devil Wears Prada.